The Governor of the Central Bank, speaking at a media briefing at the Central Bank today, revealed that the Monetary Board has decided to curtail certain transactions of Perpetual Treasuries. According to the CBSL Governor, if the irregularities have been established, a suitable inquiry can be conducted based on the report, but nobody has the right to leak the report and that would be ‘totally unprofessional’. There is no right for anybody to leak. 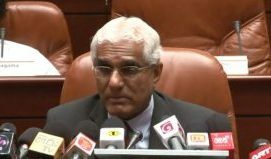 I mean that is totally unprofessional, totally unprofessional, but to leak it before the process is over, I think, is very destructive, said Governor of Central Bank, Dr. Indrajit Coomaraswamy. GOVThe governor explained that there will be a problem if the Central Bank doesn’t take the necessary action. And if the matter is fully established, action will be taken but there needs to be a proper procedure. He added that, as the governor, he cannot comment on those who held the role previously, as well as on the proceeding that took place prior to his appointment into the position. Speaking on the officers from the Central Bank who supported the former governor, he added that there are inquiries going on and action will be taken once they are completed. I cannot talk about what happened before I was appointed. I can only think about the proceedings that took place after I was appointed. These officers have been performing their role well during the past six to seven months. I do not have a problem with the way they work. That is how I can judge. There are some inquiries going on. We can take action only when they are completed. I cannot comment on former governors. A governor will not do that, said Governor of Central Bank,Dr. Indrajit Coomaraswamy.